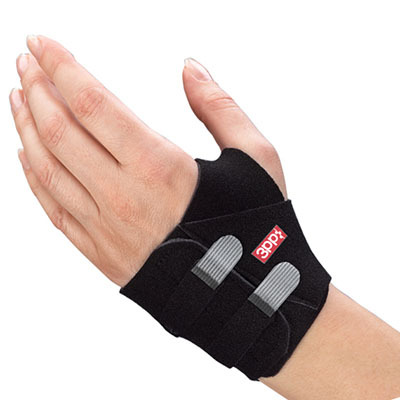 3-Point Products selection of effective and comfortable wrist and elbow splints below to treat conditions from carpal tunnel to tendinitis, sprains to TFCC, tennis elbow to golfer’s elbow. The Wrist Wrap provides controlled compression to the muscles and tendons to support sprained or strained wrists for continued daily activity. This compression wrap also helps relieve the pain from tendinitis, cumulative trauma injuries, or Ehlers-Danlos syndrome. The breathable, foam-lined wrap will not roll or bind allowing for controlled compression throughout the day. The hook receptive material allows the wearer to adjust the compression as needed. It includes a removable flexible stay for additional control where needed. The ambidextrous design fits either the right or left wrist. Size small/medium(6 1/4” to 7 1/2”). Machine washable and latex free. Dimensions: 8.75" x 0.25" x 6"
The Wrist Wrap provides controlled compression to the muscles and tendons to support sprained or strained wrists for continued daily activity. This compression wrap also helps relieve the pain from tendinitis, cumulative trauma injuries, or Ehlers-Danlos syndrome. The breathable, foam-lined wrap will not roll or bind allowing for controlled compression throughout the day. The hook receptive material allows the wearer to adjust the compression as needed. It includes a removable flexible stay for additional control where needed. The ambidextrous design fits either the right or left wrist. Size medium/large(7” to 8 1/2”). Machine washable and latex free. Dimensions: 8.75" x 0.5" x 6"
The Wrist Wrap NP provides greater controlled compression to reduce the pain experienced from wrist sprains, tendinitis, overuse conditions, instability or arthritis. This compression wrap supports the muscles and tendons to relieve pain with flexible support. The stretch resistant material offers a greater level of support and conforms without bulk. The hook receptive material allows the wearer to adjust compression as needed. The soft, breathable foam will not slip or roll and is ideal for use in sports or gym activities. Includes a removable stay is included to apply extra support where needed. Size small/medium(6 1/4” to 7 1/2”). Machine washable and latex-free. The Wrist Wrap NP provides greater controlled compression to reduce the pain experienced from wrist sprains, tendinitis, overuse conditions, instability or arthritis. This compression wrap supports the muscles and tendons to relieve pain with flexible support. The stretch resistant material offers a greater level of support and conforms without bulk. The hook receptive material allows the wearer to adjust compression as needed. The soft, breathable foam will not slip or roll and is ideal for use in sports or gym activities. Includes a removable stay is included to apply extra support where needed. Size medium/large(7” to 8 1/2”). Machine washable and latex-free. The Carpal Lift™ reduces the pain and popping sensation experienced from TFCC (triangular fibro-cartilage complex) injuries, ulnar-sided wrist pain, Guyon's canal syndrome or arthritis. It does this by applying a dynamic lift to the ulnar carpal bones. The soft, foam-lined splint is slip resistant and breathable for all day comfort and control. 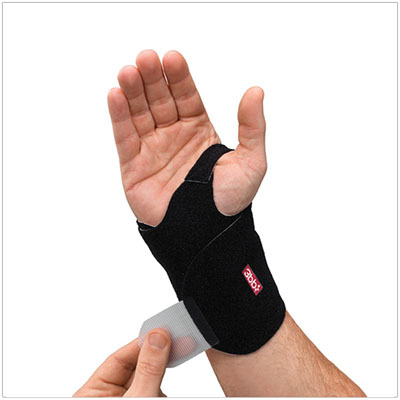 It incorporates a pad under the ulnar carpus and adjustable straps adding a dynamic lift without pressure on the ulna. The hook receptive material allows the wearer to control the amount of compression. Size small/medium( 6” to 7 1/4”) and is meant for the left hand only. Machine washable and latex free. This splint is NOT for carpal tunnel syndrome. The Carpal Lift™ reduces the pain and popping sensation experienced from TFCC (triangular fibro-cartilage complex) injuries, ulnar-sided wrist pain, Guyon's canal syndrome or arthritis. It does this by applying a dynamic lift to the ulnar carpal bones. The soft, foam-lined splint is slip resistant and breathable for all day comfort and control. It incorporates a pad under the ulnar carpus and adjustable straps adding a dynamic lift without pressure on the ulna. The hook receptive material allows the wearer to control the amount of compression. Size small/medium( 6” to 7 1/4”) and is meant for the right hand only. Machine washable and latex free. This splint is NOT for carpal tunnel syndrome. The Carpal Lift™ reduces the pain and popping sensation experienced from TFCC (triangular fibro-cartilage complex) injuries, ulnar-sided wrist pain, Guyon's canal syndrome or arthritis. It does this by applying a dynamic lift to the ulnar carpal bones. The soft, foam-lined splint is slip resistant and breathable for all day comfort and control. It incorporates a pad under the ulnar carpus and adjustable straps adding a dynamic lift without pressure on the ulna. The hook receptive material allows the wearer to control the amount of compression. Size medium/large(7 1/4” to 9”) and is meant for the left hand only. Machine washable and latex free. This splint is NOT for carpal tunnel syndrome. 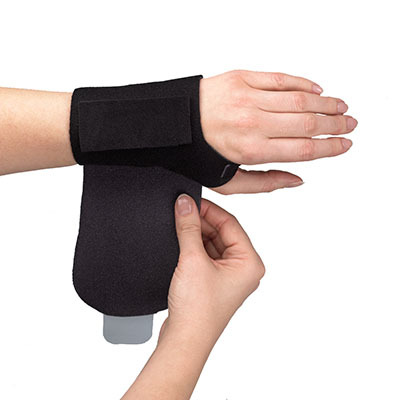 The Carpal Lift™ reduces the pain and popping sensation experienced from TFCC (triangular fibro-cartilage complex) injuries, ulnar-sided wrist pain, Guyon's canal syndrome or arthritis. It does this by applying a dynamic lift to the ulnar carpal bones. 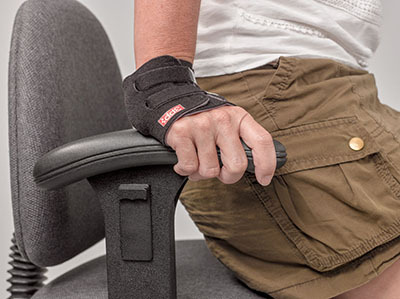 The soft, foam-lined splint is slip resistant and breathable for all day comfort and control. It incorporates a pad under the ulnar carpus and adjustable straps adding a dynamic lift without pressure on the ulna. The hook receptive material allows the wearer to control the amount of compression. Size medium/large(7 1/4” to 9”) and is meant for the right hand only. Machine washable and latex free. This splint is NOT for carpal tunnel syndrome. The Wrist POP™ (Point of Pressure) Splint applies adjustable compression over the distal ulna and a counterpoint of pressure under the distal radius for stability and effective treatment of triangular fibrocartilage complex (TFCC) injuries, ulnar-sided wrist pain, and distal radioulnar joint (DRUJ) instability. 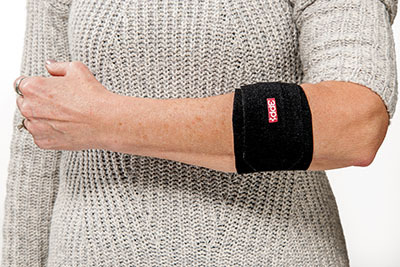 It realigns and stabilizes the DRUJ to reduce painful symptoms of TFCC injuries, DRUJ pain or ulnar-sided wrist pain. The foam-lined base sleeve will not slip or roll and allows the corrective strap to be attached wherever it's needed. The corrective strap and pressure pads allow the user to position force across the distal ulna and radius to restore stability for pain-free supination / pronation and wrist motion. Two 1/8" thick and two 1/4" thick pressure pads allow the user to choose the combination of pads needed for pain relief. The Design Line cover adds a fashionable touch while preventing hook closures from catching on clothing. Size small/medium(5” to 9”). Machine washable and latex free. The Wrist POP™ (Point of Pressure) Splint applies adjustable compression over the distal ulna and a counterpoint of pressure under the distal radius for stability and effective treatment of triangular fibrocartilage complex (TFCC) injuries, ulnar-sided wrist pain, and distal radioulnar joint (DRUJ) instability. 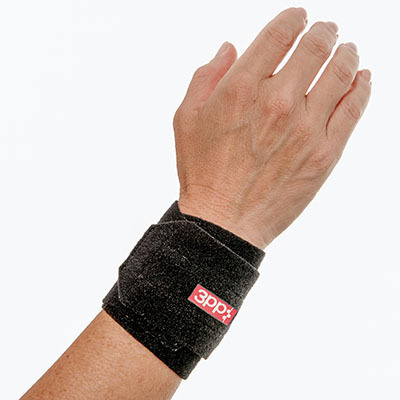 It realigns and stabilizes the DRUJ to reduce painful symptoms of TFCC injuries, DRUJ pain or ulnar-sided wrist pain. The foam-lined base sleeve will not slip or roll and allows the corrective strap to be attached wherever it's needed. The corrective strap and pressure pads allow the user to position force across the distal ulna and radius to restore stability for pain-free supination / pronation and wrist motion. Two 1/8" thick and two 1/4" thick pressure pads allow the user to choose the combination of pads needed for pain relief. The Design Line cover adds a fashionable touch while preventing hook closures from catching on clothing. Size medium/large(9” to 11”). Machine washable and latex free. The softly padded Comforter™ Splint provides the rest needed to reduce inflammation and morning stiffness caused by rheumatoid arthritis. 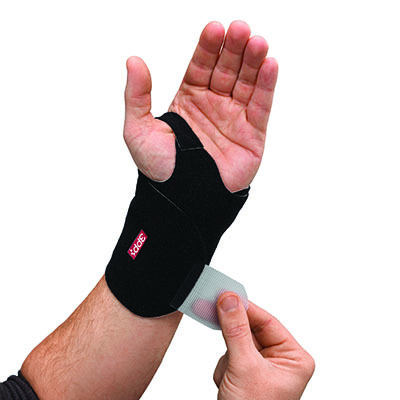 This comfortable night splint is also used for stroke patients and those with ulnar deviation of the wrist and metacarpophalangeal (MP) joints. Holds the wrist and metacarpal joints (large knuckles) of the fingers in neutral position to reduce stress on muscles and tendons. Flexible pad stays protect the fingers to lessen the damaging effects of arthritis and certain neurological impairments. The small joints of the fingers and the thumb are free to allow the wearer to manage bedding and nighttime activities. Neoprene straps include finger holes for independent application and removal of the splint even by those who have difficulties with fine motor skills. Size small(2 3/4” to 3”) and meant for left hand only. Quilted cover is removable and machine washable. Latex free. Dimensions: 12.5" x 2" x 8"
The softly padded Comforter™ Splint provides the rest needed to reduce inflammation and morning stiffness caused by rheumatoid arthritis. 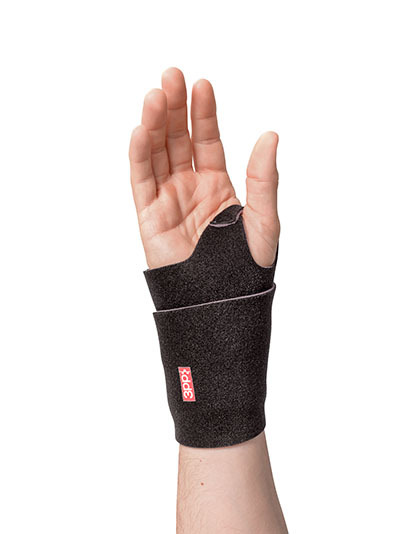 This comfortable night splint is also used for stroke patients and those with ulnar deviation of the wrist and metacarpophalangeal (MP) joints. Holds the wrist and metacarpal joints (large knuckles) of the fingers in neutral position to reduce stress on muscles and tendons. Flexible pad stays protect the fingers to lessen the damaging effects of arthritis and certain neurological impairments. The small joints of the fingers and the thumb are free to allow the wearer to manage bedding and nighttime activities. Neoprene straps include finger holes for independent application and removal of the splint even by those who have difficulties with fine motor skills. Size small(2 3/4” to 3”) and meant for right hand only. Quilted cover is removable and machine washable. Latex free. The softly padded Comforter™ Splint provides the rest needed to reduce inflammation and morning stiffness caused by rheumatoid arthritis. 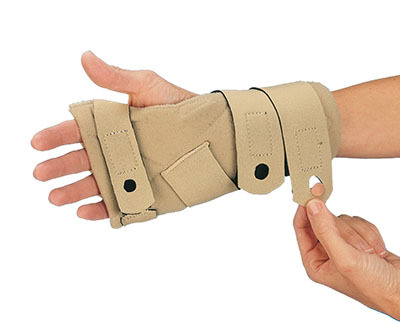 This comfortable night splint is also used for stroke patients and those with ulnar deviation of the wrist and metacarpophalangeal (MP) joints. Holds the wrist and metacarpal joints (large knuckles) of the fingers in neutral position to reduce stress on muscles and tendons. Flexible pad stays protect the fingers to lessen the damaging effects of arthritis and certain neurological impairments. The small joints of the fingers and the thumb are free to allow the wearer to manage bedding and nighttime activities. Neoprene straps include finger holes for independent application and removal of the splint even by those who have difficulties with fine motor skills. Size medium(3” to 3 3/8”) and meant for left hand only. Quilted cover is removable and machine washable. Latex free. Dimensions: 12.5" x 2.25" x 8"
The softly padded Comforter™ Splint provides the rest needed to reduce inflammation and morning stiffness caused by rheumatoid arthritis. 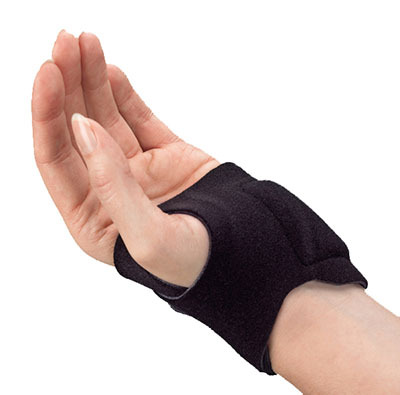 This comfortable night splint is also used for stroke patients and those with ulnar deviation of the wrist and metacarpophalangeal (MP) joints. Holds the wrist and metacarpal joints (large knuckles) of the fingers in neutral position to reduce stress on muscles and tendons. Flexible pad stays protect the fingers to lessen the damaging effects of arthritis and certain neurological impairments. The small joints of the fingers and the thumb are free to allow the wearer to manage bedding and nighttime activities. Neoprene straps include finger holes for independent application and removal of the splint even by those who have difficulties with fine motor skills. Size medium(3” to 3 3/8”) and meant for right hand only. Quilted cover is removable and machine washable. Latex free. The softly padded Comforter™ Splint provides the rest needed to reduce inflammation and morning stiffness caused by rheumatoid arthritis. 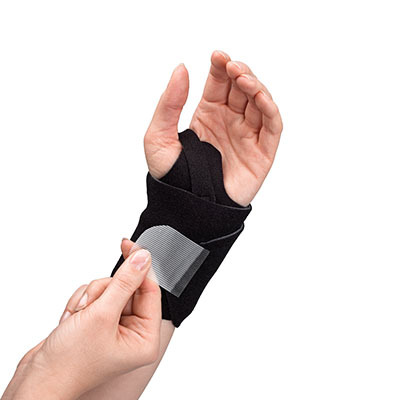 This comfortable night splint is also used for stroke patients and those with ulnar deviation of the wrist and metacarpophalangeal (MP) joints. Holds the wrist and metacarpal joints (large knuckles) of the fingers in neutral position to reduce stress on muscles and tendons. Flexible pad stays protect the fingers to lessen the damaging effects of arthritis and certain neurological impairments. The small joints of the fingers and the thumb are free to allow the wearer to manage bedding and nighttime activities. Neoprene straps include finger holes for independent application and removal of the splint even by those who have difficulties with fine motor skills. Size large(3 3/8” to 3 5/8”) and meant for left hand only. Quilted cover is removable and machine washable. Latex free. Dimensions: 12.5" x 2.62" x 8"
The softly padded Comforter™ Splint provides the rest needed to reduce inflammation and morning stiffness caused by rheumatoid arthritis. 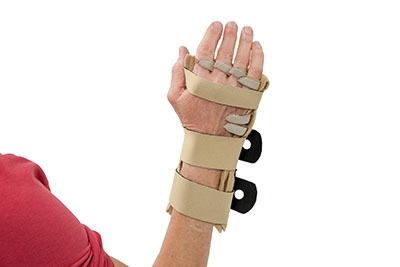 This comfortable night splint is also used for stroke patients and those with ulnar deviation of the wrist and metacarpophalangeal (MP) joints. Holds the wrist and metacarpal joints (large knuckles) of the fingers in neutral position to reduce stress on muscles and tendons. Flexible pad stays protect the fingers to lessen the damaging effects of arthritis and certain neurological impairments. The small joints of the fingers and the thumb are free to allow the wearer to manage bedding and nighttime activities. 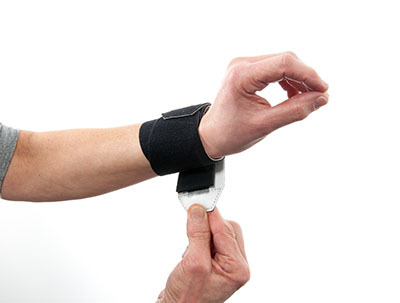 Neoprene straps include finger holes for independent application and removal of the splint even by those who have difficulties with fine motor skills. Size large(3 3/8” to 3 5/8”) and meant for right hand only. Quilted cover is removable and machine washable. Latex free. 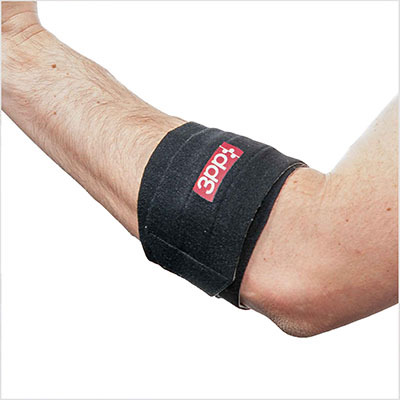 The Elbow POP™ (Point of Pressure) Splint applies an adjustable point of pressure to reduce pain from medial or lateral epicondylitis (golfer's or tennis elbow) without circumferential force. The soft, foam-lined base sleeve will not slip or roll eliminating the need to over-tighten to prevent circumferential restriction. The 1/8" thick and 1/4" thick pressure pads allow the user to determine the amount of pressure needed for pain relief. The hook receptive corrective strap allows user to place pressure pads on horizontally or vertically for targeted support. Includes a Design Line cover to prevent hook straps from catching on clothing while adding personality. Size small/medium(6” to 10”). Machine washable and latex free. Dimensions: 8.75" x 0.62" x 6"
The Elbow POP™ (Point of Pressure) Splint applies an adjustable point of pressure to reduce pain from medial or lateral epicondylitis (golfer's or tennis elbow) without circumferential force. The soft, foam-lined base sleeve will not slip or roll eliminating the need to over-tighten to prevent circumferential restriction. 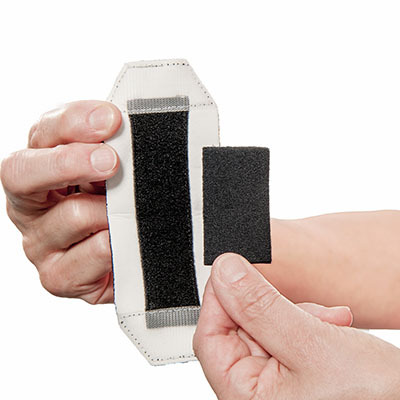 The 1/8" thick and 1/4" thick pressure pads allow the user to determine the amount of pressure needed for pain relief. The hook receptive corrective strap allows user to place pressure pads on horizontally or vertically for targeted support. Includes a Design Line cover to prevent hook straps from catching on clothing while adding personality. Size large/extra-large(10” to 14”). Machine washable and latex free.